At it’s ‘Gather Round’ launch event, Apple finally unveiled the new iPhone XS, XS Max, and the ‘affordable’ iPhone XR. All of the new iPhone devices, now come packed with the Face ID technology and makes unlocking your device super-secure. We expected Apple to upgrade the hardware behind Face ID, its TrueDepth camera system, system, with the new iPhone variants today. However, the module (as seen in the image below) still remains the same as the iPhone X, with the front camera, IR camera, flood illuminator, dot projector and much more. The major difference this time around is the focus on speed and security. 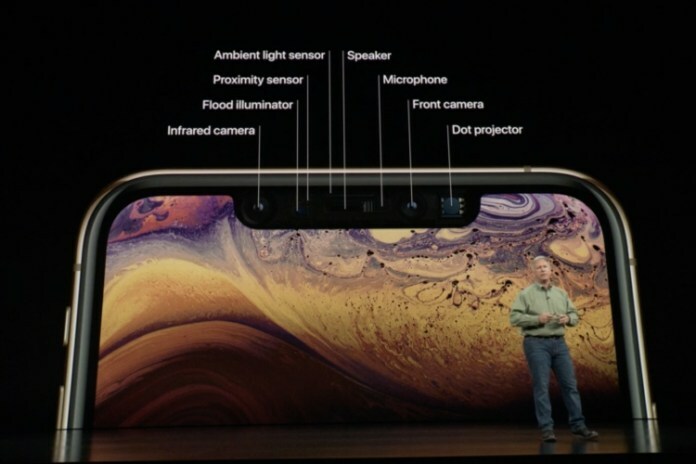 The Face ID recognition on the iPhone XS lineup and iPhone XR is now faster as compared to previous year’s iPhone X. This has been made possible due to a faster Secure Enclave in the new A12 Bionic chip, which is the component that holds your facial data and is isolated from the main processor. This simply means the phone will unlock a little faster but you’ll still need to swipe to access the home screen, which is redundant and Apple should give the user the option to skip this extra step. It does mean though that your phone is a little more secure even when unlocked. Now that all new iPhones, including the cheaper iPhone XR, come with a streamlined notch design and Face ID technology, it is safe to assume that Touch ID is dead and gone. It’s unlikely to be resurrected anytime soon unless Apple uses an under-screen fingerprint scanner. If you are someone who swears by Touch ID, then the new iPhones may not be for you. However, Face ID is more secure in this version. The TrueDepth camera system uses precision depth-sensing technology that goes far beyond the capabilities and security of two-dimensional facial scanners. What are your views on Face ID? Do you feel that Apple should bring Touch ID back? Tell us in the comments below.